I am a lazy decorator. While I admit I am a bit (ok- a lot) nutty when it comes to the way my house looks, I don't really care about how it gets there. 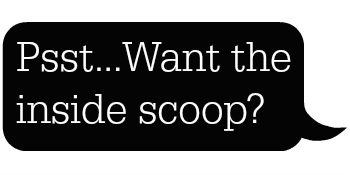 Don't get me wrong, my work is not slipshod, I do a quality job and my projects look great. I just don’t always do them according to the “directions” because a) I am impatient b) I am fickle and c)...I am cheap. When I get excited about a project, I want it done immediately. More importantly, when I want to change things up, and I update often, I do not want to feel guilty that I invested a lot of time or money in what is getting swapped out. So, I have amassed a host of decorating cheats that I use in order to accomplish my goals in my desired timeframe and budget. My best friends in this process are the glue gun, sticky Velcro, a power staple gun and an iron…proximity to a discount fabric store figures in prominently, as well. 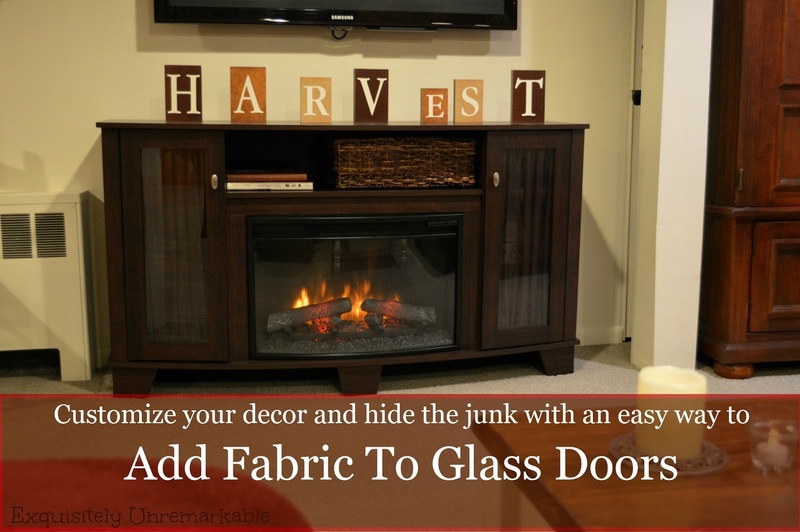 Cheat #1…Adding Fabric to Glass Doors. 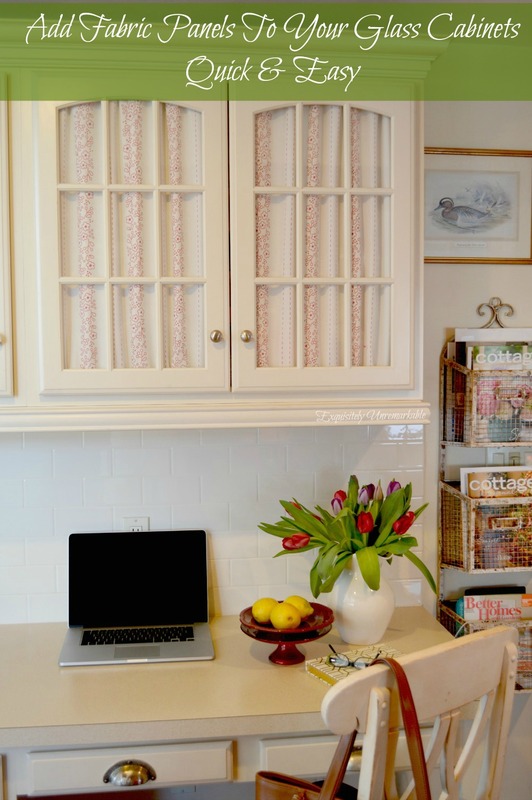 Check out the updated post where I change out the fabric on the glass cabinets for spring with complete instructions! When we renovated our kitchen I was certain I wanted glass doors on some of my cabinets and it was a great decision, they look amazing. When the lights are on in those cabinets, the whole room is glowing, especially at night, when my dishes are highlighted. The glass cabinets over my desk area look great too, all lit up with my beautiful Spode Christmas Tree china displayed…in December...the rest of the year, not so much. So, I cover the glass with fabric to conceal the holiday dishes and add some personality to the room. Of course, I change the fabric often, depending on the season and my mood, so I want to make it as easy as possible to do so. The “right” way would be to install a very small curtain rod and the top and bottom of each cabinet door and make a small rod pocket panel to fit. The cheat is to apply a long strip of Velcro to the inside top and bottom of each cabinet and then stick the fabric to it, gathering it as I go. Then, I stick the other half of the Velcro onto the teeth, so that all of the Velcro is on the door. Next, I cut my fabric about one and a quarter times the width of the glass opening and I simply stick it on the Velcro gathering it as I go. Voila! Instant curtain and when I get sick of it, I just peel the fabric off and replace it with something else, leaving the sticky Velcro intact. In the decade I have been living in this house, I have only replaced a small piece of Velcro on one cabinet; it definitely has staying power! That's it, a custom look in about 15 minutes! Let me know what you think...and I am curious, am I the only lazy decorator out there? * This trick works equally as well on glass closet doors, pantry doors, tv cabinet doors- as long as it does not need a functional window covering - you get the picture. * If you are going to use this where it will be seen, or if you are a more of a perfectionist than I am, fold the top of the fabric over about an inch and iron it for a more finished look, before you stick it on the Velcro. Want to see more examples of this project with full step by step instructions? You my friend, are a genius! One of my very best friends just bought a house and has no art work in it. We want to do some inexpensive stuff to put on the walls and to decorate the place, but don't want it to look crafty or cheap. I'm thinking you hold the key to both. I LOVE this glass/fabric idea. Then you could change out the fabric when you got sick of it. AND PLACE MATS! I just realized you could make place mats to match! Oh Lisa thank you for elevating me to genius status! I'll take it! The fabric idea is great, because it lends itself to any décor, from ultra modern to shabby chic, just choose your fabric accordingly. Also, I wrote another post about Ebay, you can get some great second hand stuff there for a song. It's like going to a giant garage sale, but you can enjoy a cocktail while you are shopping since you won't be driving! Thanks for stopping by! 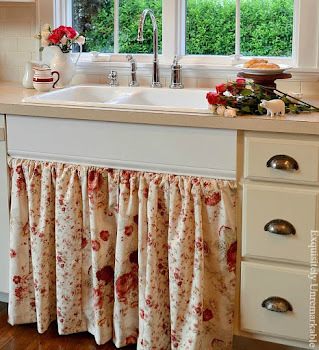 I love how you added fabric to your kitchen cabinets Kim! Your kitchen looks so comfy and welcoming! You have a fantastic blog - thanks so much for commenting on my 'In the bloglight' post! You will grow - you have a knack for writing and sharing yourself!! Best of luck as you grow and learn along the way! Pinned this!! That looks great. I like that you thought to add fabric and while it is inexpensive, it surely isn't lazy! Great job. Thanks so much for the nice comment Khloe! I can't wait to take a peek at your blog! Enjoy the weekend! Wow! I love the fabric added! This is very creative.. I am a new follower from southern charm! I would love for you to check out my blog and hopefully you will want to follow me back! Happy weekend, Nicole! That's a great idea and a great look for your cabinet doors. I like to find cheap fixes that don't cost me so much time, too. This one looks frugal and fast. Thanks for the follow on my blog! Thanks for the follow as well, Lisa! Like I said in the post, I tend to favor easy and cheap DIY projects too, so you'll be right at home here! :) Enjoy the rest of the weekend! Thanks Angela! I'm on my way over to check out your blog now! Enjoy your Sunday afternoon! What a great idea! And then its so easy to switch out the fabric later if you wanted to do a Holiday theme. Yes, exactly~ or spring or summer fabric or if I get bored! ;) Thanks for popping by to check it out and comment! You are my hero! I am debating how to cover the solid doors with fabric and still make them removeable. This looks like it would do the trick! (The inside wouldn't be too beautiful, but whose looking??? Thank you. After trying to redo my hutch doors with a linen material....2 times I found this....yea. velcro...now why didn't I think of that!! !